Much has been said about the sad incidences in the Hill Capital. No sensible human being will endorse such acts of shameful violence, irrespective of provocation or justification. Much has also been said about the actions taken to restore law and order. My attempt is to highlight the role of leadership in the face of a crisis. Authentic leaders are in high demand in ensuring prompt action towards restoring humanity. Leadership literature is full of fancy jargon and multitude of packaging as well as re-packaging. One significant trend in recent past in the east and west alike is the focus on authentic leaders. As we are aware, leadership is all about inspiring, influencing and instructing. It is more than positions and titles as it involves decisions and actions. What is the specialty of authentic leadership? Let’s discover. Authentic leaders had always been there in the world. All great religious leaders are obviously authentic. From Jathaka stories to the Bible, many such examples could be found. Yet, as in most of the cases, the real packaging was done in the west. The concept of authentic leadership was made popular by Bill George in 2003. According to his website, www.billgeorge.org, George makes the case that we do need new leaders, not just new laws, to bring us out of the corporate crisis. He persuasively demonstrates that authentic leaders of mission-driven companies will create far greater shareholder value than financially oriented companies. He describes his approach as a tested guide for character-based leaders and all those who have a stake in the integrity and success of our corporations. Authentic leaders are self-aware and genuine. Authentic leaders are aware of their strengths, their limitations, and their emotions. They also show their real selves to their teams. They do not act one way in private and another in public; they don’t hide their mistakes or weaknesses out of fear of looking weak. They also realise that knowing themselves better is an endless journey, never complete. Authentic leaders are mission driven and focused on results. They are able to put the mission and the goals of the organisation ahead of their own self-interest. They do the job in pursuit of results, not for their own power, money or ego. Authentic leaders lead with their heart, not just their minds. They are not afraid to show their emotions, their vulnerability and to connect with their employees. This does not mean authentic leaders are ‘soft’. In fact communicating in a direct manner is critical to successful outcomes, but it’s done with empathy; directness without empathy is cruel. Authentic leaders focus on the long-term. A key tenet in Bill George’s model is the company leaders are focused on long-term shareholder value, not in just beating quarterly estimates. Just as George did as a CEO of several leading business organisations, leaders realise that to nurture individuals and to nurture a company requires hard work and patience, but the approach pays large dividends over time. I was contemplating on what Bill George attempts to say. For me the key is authenticity. It comes from being ethical and effective. What could be an appropriate way to connect Bill George’s authentic leadership with what we need to do? I propose triple spheres for leaders to depict their authenticity. This is my way of depicting how authentic leaders can play three key roles which are intertwined. Figure 1 contains the details. 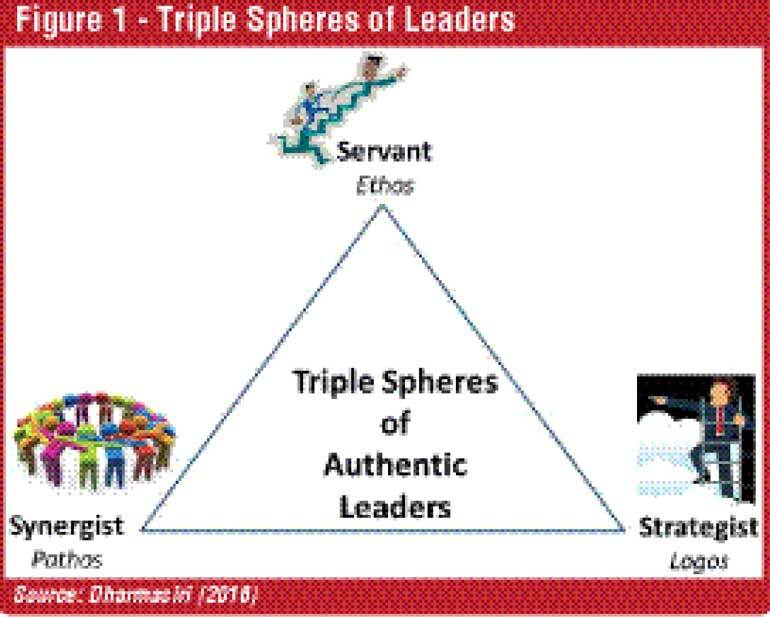 I propose for a leader to be authentic, he/she should strive on three spheres, in simultaneously being a servant, synergist and a strategist. It is very much linked to Aristotle’s model of leadership where he spoke of ethos, logos and pathos. We have often discussed the need for a leader to be a servant. It goes with the maxim that those who serve deserve leadership. It was Robert Greenleaf Robert who ‘branded’ the concept of servant leadership. “The servant-leader is servant first. Becoming a servant-leader begins with the natural feeling that one wants to serve, to serve first. Then conscious choice brings one to aspire to lead.” That’s how Greanleaf described the servant leadership. This fits to the Ethos dimension of Aristotle. It means good character, proper sense and right will. Authentic leaders should be willing to serve in a genuine manner. We find many such examples from multiple fronts. From the religious front, Mother Theresa devotedly demonstrated the dedication towards deserted children. From the business front, Jan Carlzon of Scandinavian Airlines (SAS) is a fitting example where he upheld service at all levels. “We have 50,000 moments of truth every day,” said he at the beginning of the successful SAS turnaround, referring to every time an employee of the company came into contact with a customer. Leader needs a team in order to move towards a shared dream. It is not being autocratic but democratic, not being coercive but collaborative. World of sports have many such examples where leader harnesses a winning team. Authentic leaders have to awaken the team spirit in fostering synergy. Leveraging on strengths of each team member, the leader can collectively do more. What Mahathma Gandhi demonstrated in rallying a nation with non-violence against a forceful empire is this reality. He was a true synergist and the community, even while he was in jail practiced what he preached. In the business world, we meet Steve Jobs of apple fame who spoke a lot on passion. He ignited the spirit of innovation among his team members in being a strategist. So was Narayana Murthy when he created Infosys in India where every member was proudly called as an Infosyan. This fits the Pathos dimension of Aristotle. It represents being emotionally involved and showing kindness to the followers. This is where the head comes before heart and hand. Crafting and executing “the game plan” of the organisation is what an authentic leader should do. It reminds me of a brilliant book I read so many years ago, titled, “Mind of the Strategist”. Kenichi Omae vividly depicts the triangle consisting of company, customer and competitor. Siting many Japanese business successes, he highlights the need to be sharp and specific. “Rowing harder does not help if the boat is headed in the wrong direction,” said he. This fits the Logos dimension of Aristotle. It represents deep thinking, logical reasoning, and rationally arguing. Its connection to strategy making is very clear. Having observed the nature and features of authentic leaders, let’s see the relevance to us. Are Sri Lankan managers in the private sector and the administrators in the public sector think and act like authentic leaders? I leave it for the intelligent readers to decide. One thing is quite clear. We all can improve on this front. How to be an authentic leader? I would propose five Ps to ponder. Do we know the purpose of our organisations? It can be Vision, Mission or Aspiration. Clarity leads to commitment. Are we clear about the way forward in terms of living our purpose? Authentic leaders should do so. Do we demonstrate passion in our actions? Are we ready to commit ourselves to fulfil our purpose? It is appropriate to do a soul-searching to see whether we are passionately attending to our tasks or passively doing so. Are we clear about our corporate values? Do we really demonstrate them in our actions? Are we willing to forgo monetary gains if it is conflicting with our principles? Are we really ready to sacrifice being “popular” for being “purposeful”? Then only authenticity is possible. Are we practical in our suggestions and recommendations? Do we clearly see the ground reality or still see the clutter above? Are we willing to be participatory in decision making? Do we invite ideas from our team members? This is how authentic leaders act. Do we sufficiently influence our teams towards targets? Are we really convincing others the need to achieve challenging objectives? Do we invite our teams to believe in themselves in reaching difficult goals? Such a path is required to be an authentic leader. The best way to take the discussion on authentic leaders forward is to be one of them. Authentic leaders are in high demand, locally and globally. Instead of being unethical, unfair and untruthful, what is acutely required is the authenticity. Operating in triple spheres as a servant, synergist and a strategist is what one should do. Perhaps the “human disaster” we just witnessed in the upcountry could be a wakeup call for managers, administrators and officials at all levels to think and act like authentic leaders. This is the sure fire way of restoring humanity.